1893 was a rough year for the whole U.S. due to the Panic of 1893, the worst economic depression the U.S. had experienced to that point, but it was especially rough for Homestead, since the new year began only a month after the 1892 steel strike ended. Many of the men were still out of work, wages were low, and local businesses continued to suffer. Relief poured into the town from across the country, and “numerous street fights and night attacks” suggested that some wished to stir things up again (3/6). Nevertheless, Homestead pushed on, focusing on much-needed improvements to its streets, sidewalks, and sewers; building a school; and joining a new Monongahela Valley baseball league. It’s hard to get a sense of how bad things really were in the town, but the editors of the paper, at least, felt strongly that Homestead’s best days were just around the corner, and with all of the building activity and expansion at the mill, there was much to keep the few Jews of Homestead optimistic that they had taken a chance on the right town. Below are the newspaper mentions from 1893 of members of the community, organized by theme. There are also a few mentions of the Jewish holidays, believe it or not, which I’ve posted separately. Those who know anything about Homestead’s Jewish community know that many were in the liquor business, and some quite successful at it — my family, for starters! What isn’t remembered is that it was a long road for the Jews of Homestead even to become legally permitted to sell liquor. Every year residents could apply for a new liquor license (or renewal of an existing one) — either for a saloon/hotel (at that time they were the same kind of business — and one could not sell alcohol without an eating saloon or hotel accommodations attached) or for a wholesale operation — in January and February, with hearings in the spring and results soon after. Though the license was pricey, presumably the revenue far exceeded it. In 1893 Homesteaders asked for 54 places for the sale of liquor, much more than any other town in the county (2/28). The hearings went differently than in previous years, because the attorney for the Carnegie steel company filed a number of remonstrances, with the goal of “[knocking] out all the present saloon keepers” as a way of punishing people they thought were involved with the strike (4/11). To be fair, only Skirball is someone I am certain was part of the Jewish community. Although I’m not sure what his business was at this time, it was good enough that (spoiler alert) a few months after failing to get a liquor license, he erected a new building on Eighth Avenue, which was then just becoming the business district, and installed his shoe store there. Another recognizable member of the Jewish community was involved in an unexpected way. I.S. Grossman appeared as a character witness for Herbert Abels, whose business was across the street from Grossman’s gents furnishing establishment. The Deputy Sherif testified against Abels, saying that he “was one of the most annoying persons we had during the strike, especially when drunk.” After another man corroborated this testimony, “Mr. Grossman, a character witness for Abels, got badly tangled concerning a letter he had written to the court, saying that if the court thought it more important to have a wholesale license in the building than a gents furnishing establishment to grant a license. He denied having written the letter, but Judge Porter said he was sure Grossman wrote it.” With this testimony and others, license court “almost developed into a red-hot debate on the Homestead troubles” (4/19). At any rate, all of our guys were denied, along with most other Homestead applicants. “Last year Homestead enjoyed the doubtful honor of having more liquor licenses than any other Borough in the county. The number being 22, while our neighbor, Braddock, had only 20. This year, however, a great change has been made. Homestead is reduced to 19 and Braddock increased to 26….The court, in reducing the quota of licenses, evidently desired to create a measure of reform, especially in the Second ward” (4/28). Homestead is a place where speakeasies flourish like green bay trees. [illegible] may have been pulled from time to time, their numbers never appear to diminish. It has been a mystery where they obtained supplies. Both the wholesale dealers and the saloons have suffered in their sales on account of the speakeasies. Not only that but it has been known for some time that on paydays and at other times beer has been sold and delivered to private parties by unauthorized persons openly on the street and at night. The dealers have put officers on the track of these parties, and at last discovered who they are. They come from Braddock and McKeesport, bringing wagon loads of beer. Of course they are shrewd and will not sell to every one, for fear of being caught. If an intelligent looking person asks them for a keg, they say that they cannot sell, but are only delivering on orders left at the liquor store. However if a Hungarian or a Polander wants a keg it is given him without question. Occasionally when beer is let at a house the driver will fill out and sign a blank in order to show it up if any one charges him with making the sale from the wagon. Their trade has been quite large, and the home dealers suffered in consequence. These parties of course are doing an illegal business. They are the ones that supply the speakeasies, and make it possible for them to do business. Licensed wholesalers in Homestead would not dare sell to them for fear of losing their licenses, but the wagons that come here from the places named do not have much to fear as there is nothing on their wagons to show where they belong. As stated, they have been traced up, and suits will be entered in a few days against them, when there will be a real hubbub both in Braddock and McKeesport. At this time the Jews of Homestead included ranged from hucksters 1 to shopkeepers. Between them was a great economic disparity. 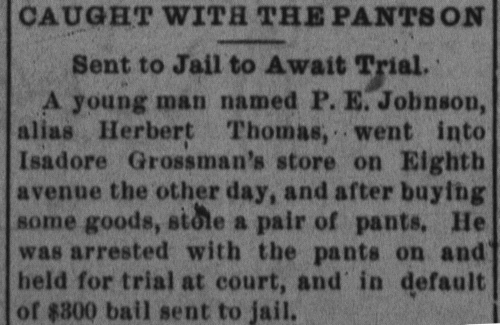 As you’ll see below, while Grossman and Markowitz suffered theft in their stores, my great-grandfather’s brother was robbed as he went door-to-door selling potatoes. Peddlers like my great-grandfather’s brother were at the bottom of the economic ladder, traveling amongst the towns of Western PA selling their wares. At this time and for many years after there was a great deal of prejudice in Homestead against peddlers — some of it quite understandable, as most came from out of town to take business away from local stores, and some of it due to age-old prejudices against the poor and minorities. To deal with the problem, Homestead and other towns in Western PA required peddlers to have licenses. 2 Nevertheless, peddling was an important entry-level profession for many Jewish immigrants, especially in rural areas. It was a stepping-stone to running one’s own store. Even the most famous Jewish banking families of the 19th and 20th centuries began this way. August 25: Max Markowitz was arrested this morning by Ordinance Officer Gessner on charge of violating the ordinance relative to cattle running at large in the Borough. This being his first offence, Magistrate Baldwin remitted the fine and Markowitz paid the costs. November 16: Squire Kuhn imposed a fine of $1.00 and costs $4.60 on S. Markowitz who was sued before him for disorderly conduct by M. Catalano. 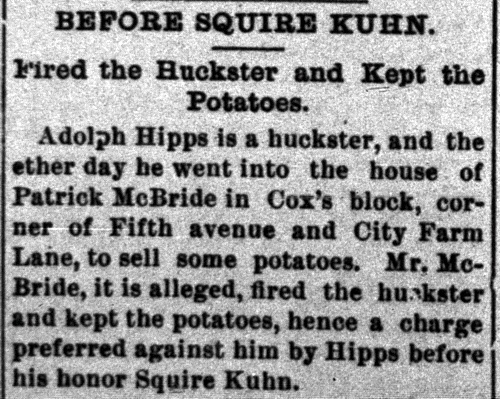 November 14: Two Arabians and four Hebrews, all peddlers, got into trouble among themselves yesterday afternoon on the road between Homestead and Hays, and will settle their difference before Squire Kuhn this evening. 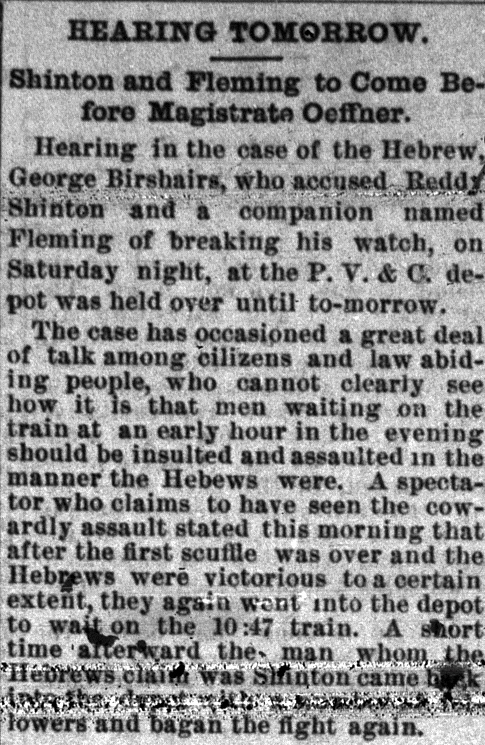 Though the “Jew rag peddler” language in the first news brief is uncomfortable, it’s the only example of its kind I’ve found in the early years of the newspapers I’ve browsed so far (1892-1897). It’s important to note that whenever the Jewish residents of Homestead are named, whether in connection with the business success or their misdeeds, they are never identified as Jews or Hebrews. Furthermore, while there is a good deal of negative press about the habits of the non-Jewish “Huns” and “Slavs” (and, for a couple months in early 1893, a running gag about a local Chinese laundryman and his brother), there are no articles that I’ve seen so far that attempt to mock or even characterize the Jewish community in any way. It’s impossible to know to what extent the newspaper’s tone reflects more prevalent attitudes, but it’s a hopeful sign that the even in the early years our community was able to coexist without serious difficulties. That said, this story presents a clear, one-sided incident of anti-Semitism. It is the only one of its kind I have seen so far (though surely there were far more that didn’t result in newspaper mentions, and it’s quite possible that the many court cases I’ve clipped involved some sort of bias that can’t be detected from the news brief). This one highlights the well-known dangers of being an itinerant Jewish peddler. August 14: A. Skirball this morning began the foundation of a two story brick business block on Eighth aenue. October 12: Geo. Hall expects to have the new Skirball building on Eighth avenue, finished by November first. Mr. Skirball will open up a large shoe store in it. October 23: The large plate glass arrived today for A. Skirball‘s new shoe store, on Eighth avenue. It was very tenderly handled by Sam Hall in transferring it from the station to the building. November 10: A. Skirball has his new store room on Eighth avenue, about ready for occupancy and next week will open out a big shoe store in it. He is putting down a curb and a fourteen foot brick pavement in front. Isadore/I.S. Grossman is one of the most important men in Homestead’s early history. Like Skirball he had been in the country for a while — he immigrated as a teenager — and had established himself in business elsewhere in the U.S. — Cadiz, OH in his case — prior to coming to Homestaead. By 1893 the newspaper already provides a few glimpses into his success and level of integration in the town. We saw one above — his testimony in the liquor license hearings — and we’ll see one more towards the end of this post. In years to come the Homestead newspaper would be filled with ads for Jewish-owned stores. In 1893, though, there were only a small number. 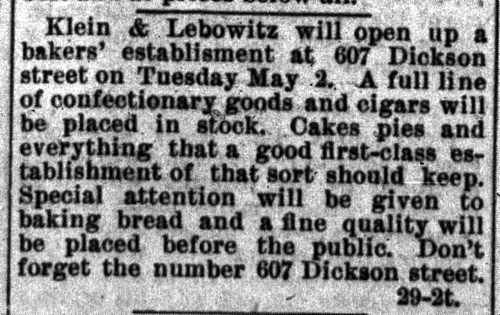 April 29: Ad for Klein and Lebowitz‘s bakers’ establishment at 607 Dickson. I’ve seen mentions of Kleins elsewhere in this period, but Lebowitz is not a name I’ve seen elsewhere. I’ve seen no other mentions of this shop and have concluded it did not last long. On October 26 and 28, a brief line-item, “Jos. Lasdusky of the People’s store, is offering bargains to suit the times, read his advertisement on the fourth page,” introduced a larger ad for his store. With Skirball and I.S. Grossman Lasdusky was the third of the original group of Jewish merchants in Homestead. He fits the pattern we’ve already seen of coming early (in his case, as a child) and getting established outside of Homestead first (in his case, possibly NYC). For a few months the paper listed students who were not absent during the previous month. Abe and Mollie Markowitz were listed for their December and February attendance. February 13: An unclaimed letter was waiting in the post office for Benjamin Friedman. I don’t know if he was a resident or Jewish, but…? In late 1892 and early 1893, after the failure of the big strike, Homestead was the focus of nationwide charity efforts for its steelworkers, many of whom were still unemployed. In March there were a couple notices that Kaufman’s, the prominent, Jewish-owned department store in Pittsburgh, donated books to one of the town’s firehouses, which served as public libraries at this time. March 22: “R. Seigleman, of Sixth avenue, is confined to his room with rheumatism.” Segelman is the fourth of the successful Jewish merchants at this time. October 24: 1893 was a difficult year for Homestead in the aftermath of the strike, and for the whole country with the Panic of 1893. Throughout, the Homestead paper attempts to maintain a tone that the return of good times is just around the corner, though with our historical hindsight, it’s hard to know it they could have really believed that at the time, or if they felt their role was to be a town booster. One hint into how their attitude was perceived at the time comes from “Isadore Grossman the Eighth avenue clothier,” who “says he calls THE NEWS the ‘Homestead Encourager,’ because it endeavors to present an encouraging view of the times to its patrons.” This quote interests me not only for what it says about the reliability of the paper’s report, but also for the level of integration Grossman must have had to have had this conversation with someone at the paper and to have had his words so valued! November 21: The paper printed a list of assessments to property owners on Heisel St. for curbing and paving the street (ranging from $39.43 to $266.17). Herman Markowitz was assessed $49.20 for 25 feet, and Samuel Markowitz was assessed $49.29 for 25 feet, which puts them on the low end of owners –but owners all the same! Though these men did not yet have the level of success of respectability as Skirball, Lasdusky, Grossman, and Segelman, they were better off than the peddlers and hucksters who formed the bottom third of the community.